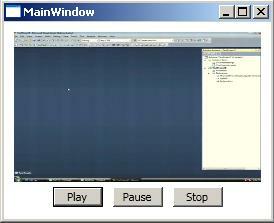 Wpf supports the video and audio using mediaelement. This will enable the developer to integrate audio and video into the application. 2. MediaPlayer - Drawing object – only from code behind. These classed are controlled from UI. These classes will internally use Windows Media Player 10 control for media playback. In this mode, the media play back is driven by the media content. This provides the option of media uri, playback options and position-speed ratio of media. Loading of media is done through object's Source property or using Open method of MediaPlayer object's Open method. Available media object controls: Play, Pause, Close, and Stop. In this mode, media playback is derived from MediaTimeline. This provide the option of Media's Uri using MediaTimeline,playback using clock. Loading of media is done through object's Source property of MediaTimeline. Creating the clock from the timeline, and attaching the clock to the media object when used in story board. media playback clock is controlled by using ClockController control methods in clock mode. LoadedBehavior and UnloadedBehavior properties control the behavior of the MediaElement when IsLoaded is true or false. <Button Width="50" Height="20" Name="play" Content="Play"
<Button Width="50" Height="20" Name="Pause" Content="Pause"
<Button Width="50" Height="20" Name="Stop" Content="Stop"